All buyers will also receive a Bonus Coupon for all ArcSoft Software ! 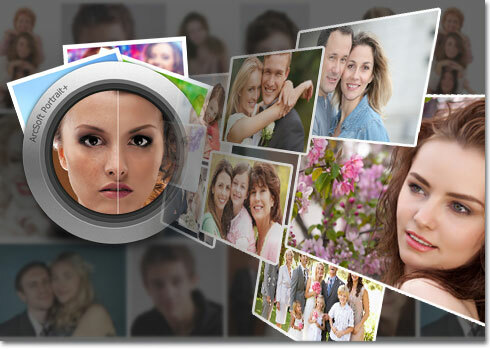 Upload one or thousands of portraits and Portrait+ automatically detects the faces, and then applies natural or glamourous portrait enhancing filters. Editing portraits has never been this simple to everyone, especially portrait photographers! “Having tested just about every auto-retouching software on the market, ArcSoft Portrait+ has some very nice features that will appeal to photographers who want to retouch one or several photos quickly." Accurately detect faces with 24 key facial features. Up to 20 faces can be recognized and retouched simultaneously in one photo. Auto detect all visible body skin for intelligent retouching. Smoothly import hundreds of images within seconds. With one-click, stunning presets are applied to all photos. Enhance photos with manually edited effects. Batch export all photos to any folder with adjustable size and quality. Smart blemish removal eliminates deep scars, pimples and other imperfections while simultaneously restoring the original skin texture. Reshape and fine tune facial feature with a click. Optional makeup kits to beautify portraits. Easily find the best results with an embedded comparison interface. Enhancement tools allow optimizing an effect and creating new presets. Retouch some faces while ignoring others in a photo. It comes with the PHOTOSHOP plug-in? The update to version 3 will be free or paid? If paying, what will be its tariff. I have Perfect365 from a previous Zot. I find it clunky and quirky (always wants to save your file with the name Perfect365???). Anyone have any experience with this? And yes, does it include a Photoshop and/or Lightroom plugin? Hi. Have a look at Beautune. It’s not so automatic, but you have many options to tune your pictures of people – not only the face. Perfect 365 is not that precise. Sometimes it just did not recognize the face and even if you would be willing to set the points, it just did not open the picture. And the automatic of finding the points errors often. With that said, i wonder if this software deal is that much better in this points. I just tried the trial and the effects on some of the settings are way off. Eye makeup on cheeks, etc. I’m sure this is adjustable but if I’m going to do that I’d rather use what I already use,Portrait Professional Studio. No I don’t work for them. It’s a good start though. I’m just not sure it’s worth $99. Much less $249! Only Portrait+ for Mac is available here at $99.99. We’re still working on the plug-in for Mac. But the Photoshop Plug-in for Windows is available, which will be given for free with the purchase of standalone Portrait+ for Windows in our website for now. It’s free to upgrade to version 3, but please note that the version 3 of Portrait+ for Mac is not availbale for now, the one you see on our website is for Windows. We’re working on the new version for Mac. You can save the photos without product names in Portrat+. Please try out the trial version, then you can know better about the features. The promo purchase here is only for standalone Portrait+ for Mac, its Photoshop plug-in is not available for now. We’re working on the new version 3 and its Ps plug-in. Thanks for your comment. We’d like to invite you to have a try on Portrait+. It focuses more on skin smoothing(not just face, also the visible body skin) and feature enhancing, but also can add digital makeup. Feature detection can be adjusted if not correct, and most auto detection is ok to be used for basic retouching if glamourous makeup is not required. The product you mentioned from other company is different from P+ on product positioning. It seems only for one photo each time, and almostly manual. While Portrait+ aims to help users improve efficiency , and to bring them fast & easy-to-use experience. When is the Photoshop plugin for Mac expected and will it be free to purchasers of this MacZOT when it is available? Also when is the expected ETA for version 3? Does very well at masking and finding facial points*. Fine tuning can be accomplished through the DIY section. The ability to save presets. Ability to chose which faces to apply enhancements. I was able to produce very acceptable results that did not look “manufactured”. This application will prove a huge timesaver for batch processing. Obviously, version 3 will only make it better. *My only letdown is that my absolute favorite photograph of my wife would not be accepted by the application although it never warned, as it did with some others, that the application would not work with it. Portrait+ mask it perfectly, but there were no “key points” available, and it would not allow any enhancements other than using the blemish tool. I too would like to know when the arrival date is expected for the photoshop plug-in for mac version of this P+ software. Please let us know before this zot deal runs out. It will be great to know so a possible purchase can be properly assessed re): future use re: photoshop plug-in. Thanks! Thank you so much for your interest in Portrait+! Version 3 of Portrait+ for Mac and its PS plug-in may be available at the end of this year, but for the exact date, we’re sorry that we can’t confirm that at the moment. We do wanna release them as soon as possible, but we can’t release a product that is not ready to go. If you’re interested in Ps plug-in for Mac, please check our website at the end of December to see if it’s released. If you’re interested in Portrait+ for Mac, you can purchase this offer here, and then upgrade to version 3 for FREE when new version is released. Sorry to hear that your wife’s photo couldn’t be enhanced with the tools but the blemish tool. 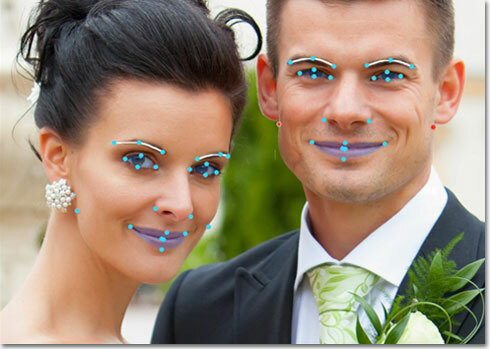 If a face could be retouched (since you can use blemish tool), the face is detected and there should be “key points”. Please re-start the program and rename the photograph to see how it works this time.